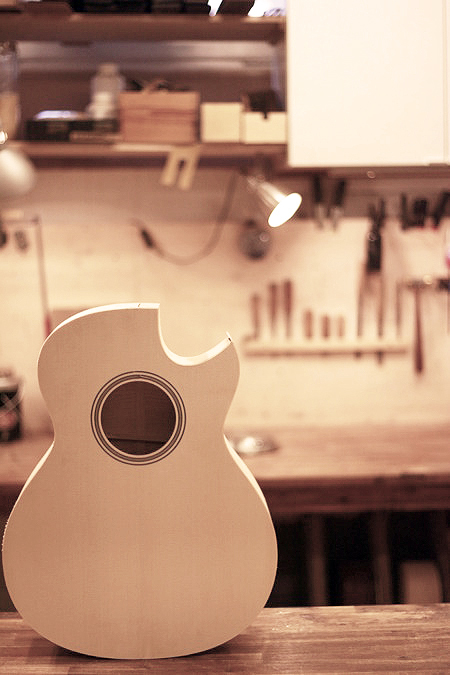 To build a guitar for you i need to know a little bit about you, what music you are playing and in which context you will be using the guitar. You are very welcome to meet me in here my shop, but I can also correspond by email or phone. I only build around 12 guitars each year which means I can dedicate all the time needed with every client to make sure both of us are satisfied with the guitar. The waitlist is currently about 3 years. The 2019 base price for all standard guitars is $7000. Please read below what is included into the base price. When you order a guitar I ask for a $500 deposit to secure your place on the waitlist. Please note that this deposit is to cover initial expenses such as special materials and design work for your guitar and is not refundable. The remaining balance is due before delivery of the guitar. I build all my guitars here in my workshop, by hand. This means i can be very open to changes from my standard appointments. Please note that cost of shipping, local taxes or vat is not included in the price. All my materials are the highest quality available. By this, I mean, the highest quality available. I personally visit my suppliers and go through their stock to select only the very best. As of january 2nd, 2017, all instruments containing any kind of rosewood, ie any kind of the species Dalbergia, will need to be accompanied with a Cites permit for shipping outside the european union. Trade within the EU is excepted from this. All of my stock has the proper documentation and you will not need to worry about this, however there might be some delays in shipping due to the waiting time to get copies from the authorities. Dont hesitate to contact me if you have any questions about this.